Model no. char. Size" Lines/ Stencils Char./Ft. For stenciling applications on porus and nonporous surface. Large ink recervoir in handle. 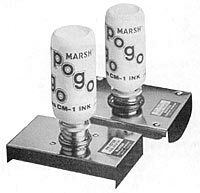 Pump action button for fast, uniform dispensing of ink. Choice of 3" or 1 1/2" rollers. Model - 310230 - 3"
For use with Fountain Rollers and Hand Rollers. Comes in 1 quart cans. For big stencilling jobs where speed and convenience are important factors, fountain brushes are the ideal answer. Recommended for use with quick drying ink, comes with cover. Spring action assures clear, clean marks on porous surfaces. Standard blue stencils have a 2 7/16" x 4" size and come 1000 per carton. Lets your mark on oily, wet or dry surface. In all kind of weather—and handle the part immediately. A fast drying, lead free paint marker, ideal for all surface. Weather and fade resistant. Replaceable fibre tip ensures full use of the marker. Marker range: -50o to 150oF. PA424 Replacement Tips (12/pkg) , each pkg. Extra tough tip that won't spread or mush. High visibility ink. This hand roller gives clear, distinct marking at an economical price. Stencil ink pads sold separately. Spray stencil ink works on almost any surface. Available in a 12 oz. can, this spray stencil ink does not contain fluorocarbons. The original all purpose cold surface marker -50o to 150oF. Produce long lasting, weather and water resistant fine line mark with real paint that dries in minutes. 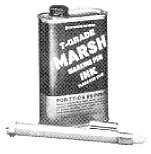 Liquid ink supply - write 7 to 10 times more than standard markers. Sealed ink supply - will not dry out. Heavy duty tip - will mark any surface. Instant drying marker that writes on all surface. It is also waterproof.